Tender, pithy, and steeped in respect, Never Sit if You Can Dance is a light-filled biographical work. 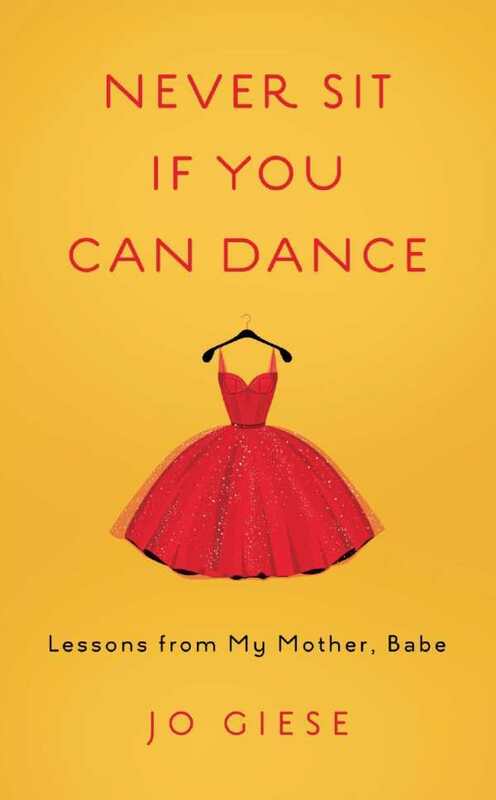 Jo Giese’s radiant tribute, Never Sit If You Can Dance: Lessons from My Mother, Babe, gathers brief essays that illustrate a lively worldview. From gratitude to fashion, travel to embracing hardship, these distilled messages reveal an inspiring optimism. Born Gladys, nicknamed Babe, and thriving until she was almost ninety-eight, Giese’s mother is drawn through careful memories. Fragments of everyday life create a loose timeline pinned with images. Giese’s eye for detail, because of which observations flower toward greater kinds of meaning, proves noteworthy. A green, linoleum dance floor recalls Babe and her husband’s passion for hosting parties in the 1950s; an orange mandarin collar jacket, handed down to Giese, signals the bold decision to choose what’s cheerful over easier invisibility. Flowers offer a reminder of connectedness. Whether they are lighthearted, serious, or elegiac, topics are addressed with graceful candor. The pieces add up to a perspective that values relationships without needing to speak about them, and in which gestures become their own language. In “The Good Goodbye,” accompanying guests to the curb is presented as an act of thankfulness; the essay encourages thoughtfulness toward loved ones. “Never Show Up Empty-Handed” is a foray into kindness of the sort that never grows old. Other advice derives wisdom from trivial places, as in “Don’t Be Drab!”, a fun, sartorial essay on color with a reminder that everyone is worthy of variety. A few essays address Babe’s experiences as a midcentury housewife, from which Giese, a self-proclaimed feminist, draws insight, despite having once thought that such experiences couldn’t speak to her. They include “Maybe We All Need Someone Waiting for Us in the Parking Lot,” in which embroidering while waiting in the car is not a passive act, but a loving gesture of support. Essays vary between forms of entertainment and self help vehicles. Most of their lessons come down to good manners. More than just nostalgic, they’re reminders to live with conviction and joy that acknowledge life is fragile. “Go! While You Can,” an exhortation to travel and accept spontaneous journeys, especially highlights this. Babe’s infectious enthusiasm comes through in anecdote after anecdote, though she’s seldom placed on a pedestal. She emerges as a humane person who was sometimes shortsighted, as when she failed to offer her children praise. Imperfections in parenting are presented with forgiving hindsight. Even through its tough moments, including Babe’s miscarriages and death in hospice, the book is an upbeat exploration of the little things that make people who they are.